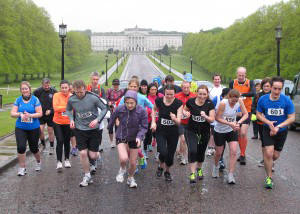 The Met Office had issued amber warnings for rain, yet despite the weather forcing other sporting events to be cancelled – the Stormont Steeplechase went ahead and there was a great turn-out. Fun runners were joined by runners from East Down AC, North Down AC, St Peters AC, Orangegrove AC and Co Antrim Harriers to take part in the first ever AMH Steeplechase. 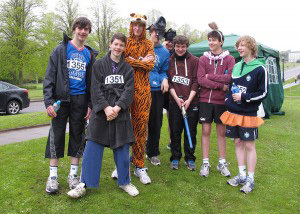 The event was organised by East Down Athletic Club, with all proceeds going to AMH. There were two distances – the Fun Chase was a 2 mile loop in Stormont Estate, with a few steep hills, lots of mud and the “jumps”. 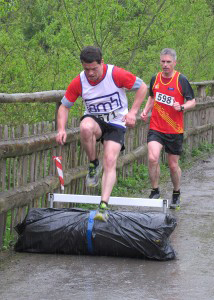 This race was won by East Down Athlete Chris O’Connor, with Ryan Betts coming in a close second (in fancy dress!) and Fergus McMullan taking third place. The Fun Chase really was for everyone! – Tigger, Darth Vader, Batman ….. 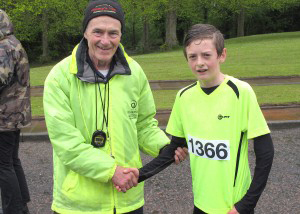 The main race was an 8k cross country steeplechase – 3 loops of the challenging Stormont course – and was a closely fought contest between 2 East Down Athletes. The lead changed numerous times during the course of the race with James Savage (EDAC) eventually being named the victor in a time of 34.44, with his club mate Mark McDowell coming in second in 34.55. North Down Athlete Terry Eakin was third in a time of 38.04. The ladies race was won by Ali Robinson from North Down AC in 38.51. Natalie Thompson was second (41.50) and Joan Melanophy from St Peters AC was third (43.52). There were prizes for 1st, 2nd and 3rd in the Men and Ladies Races and medals and sweets for everyone who took part in the fun chase. Despite the rain – which didn’t dampen the enthusiasm and spirits of the competitors, everyone agreed that it was a really fun event, with plans in the pipeline to hold another running event in the very near future. Thanks to Joe Quinn and the East Down Athletics club for organising the event and to everyone who took part and raised lots of money for AMH. Thank you also for the volunteers who helped out on the day. 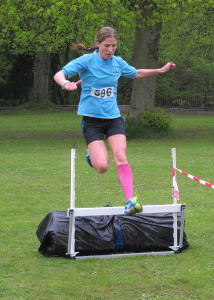 Winner of the ladies race, Ali Robinson NDAC flew over the jumps!